I’m halfway to weekend mode on Fridays! Who doesn’t love the weekend? Sleeping in a bit, wearing pajamas and making pancakes. Bliss. I also like to add ground flax seed for its nutritional value and its nutty flavor. It is high in fiber, omega-3s and antioxidants. The recipe will still work if you omit the flax, but it really is worth a try. My family’s favorite addition to pancakes is banana! 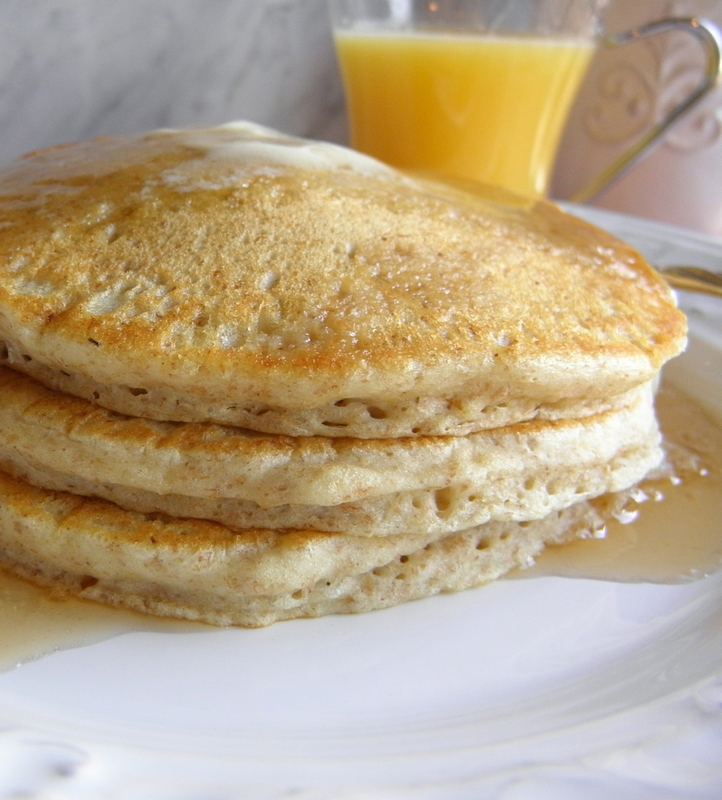 Just slice them up and drop them right onto the pancakes as soon as they’ve been poured onto the griddle. Once the pancakes are flipped, the banana caramelizes on the griddle…they are amazing! In a medium mixing bowl, using a whisk, combine all dry ingredients up to the salt. In a small bowl, whisk the egg whites for a minute or two until they form soft peaks. Combine the egg yolk, oil, milk, yogurt, vanilla and sugar in a batter bowl. Whisk well. Add the dry ingredients and mix just until combined, but do not overwork it. Using a wooden spoon or a rubber spatula, fold in the egg whites gently, also, just until combined. Spray or brush the griddle with canola oil. I like to use a quarter cup measuring cup to drop the batter onto the griddle to keep them uniform. As soon as they bubble and firm a bit on the edges, take a peek. If they look golden, turn them over. That second side takes much less time to cook…so get them off quickly.